Cortana is the scripting engine built into Armitage and Cobalt Strike. It’s based on my Sleep scripting language. Most scripting languages have a REPL (Read, Eval, Print Loop) that allows users to experiment with the technology in an interactive way. I didn’t build an REPL into Cortana natively, but one is available as a script. This script is eval.cna. Go to the Cortana Github repository, download eval.cna, and load it into Armitage or Cobalt Strike. You can do this through the Armitage -> Scripts. Go to View -> Script Console to open the Cortana console. The eval.cna script adds three commands to the Cortana console. These are x, ?, and e.
The x command evaluates an expression and prints the result. In Sleep, this is anything you can assign to a variable or pass as an argument to a function. For example, x 2 + 2 prints out 4. The ? command evaluates a Sleep predicate expression and prints whether its true or false. A predicate is anything you can use in an if statement or while loop. For example, ? -iswinmeterpreter 1 prints true if session 1 is a Windows Meterpreter session. Finally, the e command evaluates one or more Sleep statements. Use this command to quickly try out a for loop or a more complicated series of statements. These commands make it very easy to explore Cortana and interactively interrogate your Cobalt Strike or Armitage instance. If you’d like to learn more about Cortana, I recommend that you consult its documentation. When a user launches Armitage or Cobalt Strike on Windows and presses Start MSF, they’re presented with a curious error. It states: You must connect to a team server hosted on Linux. Connecting to a Metasploit RPC server on Windows is not supported. This error generates a lot of requests for help in various forums and I occasionally get email about it too. Armitage and Cobalt Strike are clients designed to connect to a server. There are two options for this server. They may connect to the Metasploit Framework directly via its RPC server. Or, they may connect to a team server. The Metasploit Framework’s RPC server is a version of the Metasploit Framework that allows third-party tools to interact with and control it. You can read about what it provides in the Metasploit API documentation. A team server is an Armitage (and Cobalt Strike) construct that wraps the Metasploit Framework RPC server and provides additional services. I originally built the team server to share a Meterpreter session among multiple users and to provide needed functions to use the Metasploit Remote API from a remote client. In November 2013, I made the decision to drop Windows support for the server side of Armitage and Cobalt Strike. This means that you can not setup a team server on Windows (this was never supported) and the tools do not allow you to start the Metasploit Framework and connect to it on Windows. You may still use Cobalt Strike and Armitage from Windows though. Start a team server on Kali Linux or one of the other supported environments. Tell Armitage or Cobalt Strike to connect to this remote team server. Everything will work fine. I have a philosophy. Armitage should make common actions simple and efficient. As soon as you need to break away into an uncommon action, use a console. Because the console is so important in Armitage’s use, I put a lot of effort into making Armitage a solid interface to use the Metasploit Framework console through. There’s a lot of shortcuts and other valuable tools in the Armitage console. I don’t think many folks are aware of these, so I’d like to take you through a few of them now. To open a Metasploit Framework console tab in Armitage, go to View -> Console. You may open as many console tabs as you like. To search for text use Ctrl+F. This shortcut will show a search box at the top of your console tab. Type something and press enter. The results will stand out in your console tab. The Armitage console tab has the same tab completion you’d enjoy in the msfconsole program. Armitage’s console tab keeps a command history. Use the up arrow to go back and the down arrow to go to the next command in the history. To put a console tab in its own window, press Ctrl+W. To close a tab, press Ctrl+D. You may rename a console tab to. Right-click on the X in the tab and select rename. This is a great way to keep track of tabs dedicated to a special purpose. To interact with a session you could type sessions in a console tab or just press Ctrl+I. This shortcut will open a dialog where you may choose a session to interact with. To clear the edit box in a console tab, press Escape. To increase the font size in a console, use Ctrl+Plus. To decrease the font size use Ctrl+Minus. Ctrl+Backspace resets the font to the default. This feature is wonderful for demonstrations. Armitage logs each console tab. Go to View -> Reporting -> Activity Logs to open the logs folder. What’s in a Team Server? Clients (like Armitage) interface with the Metasploit Framework through its Remote API. The Remote API is a way for clients to call functions in the Metasploit Framework’s RPC server. To pass different data types to/from the Metasploit Framework, clients use the MessagePack object serialization format. Because clients may interface with the Metasploit Framework in this way, I’m sometimes asked… why can’t I connect Armitage to the Metasploit Framework RPC server directly? Worse, I’m sometimes asked for support by enterprising users who skipped the documentation and tried to wing setup on their own. Now, let’s get back to the topic: Why do we have a team server? The Metasploit Remote API is great, it allows one to query and execute modules. It also has an API to interact with a console. To build a collaboration environment on top of the Metasploit Framework, there are a few gaps. This is where the team server comes in. Armitage’s team server is a wrapper for the Metasploit RPC server. The team server adds functions for real-time communication, data sharing, and session sharing to the Metasploit Framework’s RPC server. 1. The team server is the center of Armitage’s ability to share sessions. Through it, I force any calls to meterpreter.read and meterpreter.write through a session multiplexer. This code adds Meterpreter commands to a queue with a tag. When the command executes, the multiplexer uses the tag to identify which client to send the output to. All clients that interact with Meterpreter, through the team server, do so with this multiplexing logic in place. This logic is what allows Cortana bots and Armitage/Cobalt Strike users to transparently share sessions. 2. Shell sessions are a different story. All commands in a shell session depend on the current working directory and I decided, early on, that it would be dangerous to transparently share a shell. For shell sessions, Armitage provides an API to request a lock on a session and an API to release the lock. If the Armitage client gets disconnected (for whatever reason), the team server automatically releases the client’s locks. If one of your teammates tries to interact with a shell that you own, they’ll get a message that states you are using the shell. 3. Early versions of the Metasploit Framework Remote API included calls to deal with the Metasploit Framework’s database. These calls were added by Ryan Linn for his DEF CON 19 talk, Multi-Player Metasploit. In November 2011, there was discussion about removing these calls altogether. The argument was that these calls were never documented in the Metasploit Remote API. To the best of my knowledge, if these calls are still present, they’re considered deprecated and could go away at any time. To give Armitage clients access to the Metasploit Framework’s data, the team server emulates these database calls by talking to the database directly. Emulating these database calls in the team server greatly improved Armitage’s performance. First, I saved a pass through Ruby on Rail’s active record cauldron of magic. I also save the CPU time to serialize data to MessagePack and unwrap it again. But, most importantly, controlling this code allowed me to design a scheme where the client communicates a hash of what it knows. The server uses the hash to decide if anything changed. If nothing changed, the data is not sent. This change made the Armitage team server infrastructure scale well to many clients with a lot of hosts. 4. The team server also provides a few random functions not present in the Metasploit Remote API. The team server offers a way to send files to or get files from the team server’s system. This is important as many Metasploit Framework modules have options that reference files local to the Metasploit Framework. The team server also provides calls that make real-time chat in the event log possible. So, the next time you’re interested in connecting Armitage to a remote msfrpcd directly, beware that the team server exists for a reason. If you’d like to learn more about the team server, I published a paper a few years ago: Network Attack Collaboration: Sharing the Shell. The information in this blog post updates the information in the paper, but the paper still has a lot of good information. Armitage and Cobalt Strike 1.47 are now available. This release improves many aspects of the workflow in both Armitage and Cobalt Strike. Here are some of the highlights. 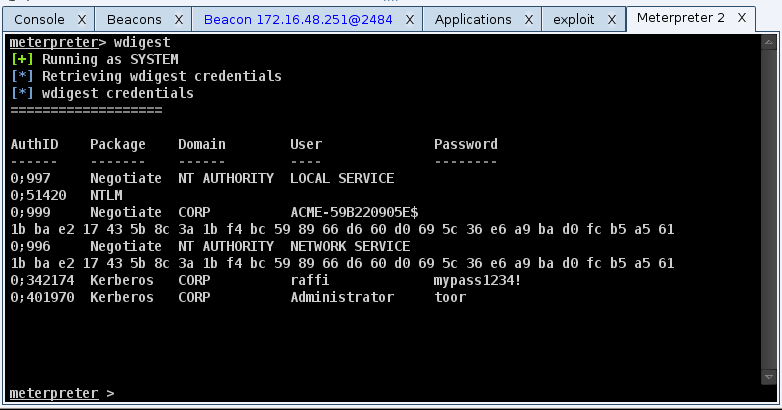 Type ‘meterpreter’ in a Beacon console to spawn a Meterpreter session and tunnel it through your Beacon in one fell swoop. This gives you the power of Meterpreter and its features with Beacon’s communication flexibility. You now have the option to specify a jitter factor with Beacon’s sleep command. This jitter factor will vary the sleep time after each check in to make your Beacon harder to see. You may now use Beacon to manage long term, low and slow exfil. Beacon manages this by delivering files one chunk per checkin. The speed of the download is up to you, just change the sleep time. The system profiler now annotates 64-bit Windows and a 64-bit Internet Explorer with a *64. This should help your decision making process, when picking the right attack. Cobalt Strike’s Java Applet attacks now inject shellcode through a Windows 64bit JVM. CVE-2013-2460 is now part of the Cobalt Strike Smart Applet attack. This makes the Smart Applet attack effective up to Java 1.7u21. The AppletKit in the Cobalt strike arsenal has the source code to these latest Java bits too. Version 4.7 of the Metasploit Framework includes a psexec_psh module and Cobalt Strike supports it. This variation of PsExec uses PowerShell to inject your listener into memory without creating an artifact on disk. This is a great way to sneak past anti-virus on modern Windows systems. This Cobalt Strike release gives you an option to mask email addresses in the Social Engineering Report. You also have the option to mask passwords in the Hosts Report too. Kali Linux users–you have a reason to cheer too. This update brings back the close button on Armitage and Cobalt Strike’s dialogs. These updates also fix several bugs, tweak several options, and make both programs more robust and faster. To learn more about what’s new in Cobalt Strike 1.47, read the release notes. A 21-day trial of Cobalt Strike is available at http://www.advancedpentest.com. Licensed users simply need to run the update program to get the latest. In 2011, I participated in an exercise. The exercise ran for 60 hours straight, forcing the red team to work in shifts. The event was a typical red and blue exercise. Red team attacks. Blue teams defend. Blue teams were scored on their ability to protect the confidentiality, integrity, and availability of tokens (text files with a random string) they were required to store on their systems. This particular year, we were very successful. We compromised all the blue teams and captured a token from each of them. Late into the event though, while we were focusing on our last of three hard targets, one of the developers of the scoring system ran into the room asking for proof about one of the tokens. I knew we had captured it, but we had no proof and this particular file ended up a point of dispute right until the end of the event. After that, I added logging to Armitage. Since September 2011, Armitage and by extension Cobalt Strike log every open console tab–period. These logs are created and stored local to the Armitage and Cobalt Strike applications. These logs are automatically organized by date YYMMDD, team server you’re connected to, and host. The all folder contains logs for files that apply to multiple hosts (or no hosts at all). Cobalt Strike and Armitage also capture all of their screenshots in this way too. Screenshots and Webcam pictures are saved to ~/.cobaltstrike/[YYMMDD]/[user@server]/[host]/Screenshots. At the end of an engagement, if you’re ever looking for a file, now you know where to look. Conveniently, these logs are linked via the View -> Reporting -> Activity Logs menu. One problem with this scheme, especially in a team context is these logs are scattered across multiple systems. One solution: create a file share, mount it on all the red team systems, and configure Armitage or Cobalt Strike to store the files somewhere on this share. 2) Find the armitage.log_data_here.folder. Double-click the value column. 3) Type the path to the share. Consider adding a subfolder for the current red team member to the scheme. Voila, your logs will now all go to the centralized location–suitable for offline analysis by someone else. Sometimes during an exercise or a penetration testing engagement, one of your team members will come across something interesting. The old adage is–make sure you take a screenshot or it doesn’t count. During an exercise, I’m almost always running screen recording software (Screenflow on MacOS X is awesome) with sound recording turned off. I’m able to store 1 day of work in about 1GB. This is the ultimate solution to make sure you capture everything. Cobalt Strike and Armitage help you out too though. Press Ctrl+T to quickly take a screenshot of the current tab. Cobalt Strike and Armitage will save the exact state of the open tab to [log folder]/[YYMMDD]/[user@server]/screenshots folder. The name of the file will show the time the screenshot was taken and the name of the tab. That’s it. One keyboard shortcut and you always have a screenshot. The nice thing about this feature is you can easily copy and paste these images to your reports and they do not need any editing. They also look great on slides. Finally, let’s talk about all the data stored in the database shared by Cobalt Strike and the Metasploit Framework. You can export this tool. Go to View -> Reporting -> Export Data. As an added bonus, the data export feature also creates a screenshot of the targets area, whether it’s in the graph view or table view. This too is suitable for copying and pasting into a report. With these features in mind, it’s pretty easy to keep track of an engagement and retrace your team’s steps whether you’re using Armitage or Cobalt Strike. You are currently browsing the archives for the Armitage category.